Audio started blaring, and a robotic voice told me my computer was infected and I would lose all my data if I didn't call Microsoft technical support. A modal dialog prevented me from leaving, the URL bar started growing and eventually my browser froze completely. Definitely an impressive display! Of course, my computer was not infected with malware. The "RDN/YahLover.worm" referenced by the website is fictional, and is part of a series of online scams trying to coax victims into believing their computer has been infected by a virus and can only be fixed by calling a toll free hotline. The "Microsoft certified" technician on the phone will then "fix" the affected computer for a fee and/or talk the user into installing actual malware. 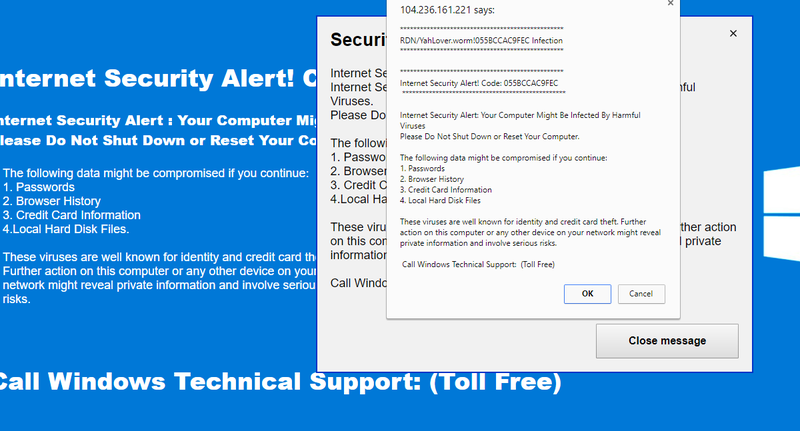 A writeup by malwarebytes has a nice compilation of variations of this scam found around the web. Being somewhat familiar with computers, I didn't try to call the hotline to have a technician fix my computer. Even if I wanted to, I would have been met with slight difficulty: the scammer forgot to put down a phone number to call. However, I was still left feeling very uneasy - my browser froze complety, and it wasn't unthinkable the website could have used a Chrome exploit to drop actual malware on my system. To make myself feel more at ease (and because I was curious), I decided to dig into the inner workings of this scam website. The website was hosted by Digital Ocean, a popular cloud provider - even scammers seem to have embraced the power of The Cloud™! Luckily Digital Ocean provides an email address to report abuse, and I've contacted them about the offending website. At the time of writing they have not yet responded, but they likely will take appropriate action. With DigitalOcean notified, it was time to take a look at the website itself. I wanted to confirm whether my machine could have been compromised, and I was also curious to see how a scam website is built. The first step in this process is to download a local copy of the website so we can inspect it in peace. Since browsers have the nasty habit of rendering and executing all websites they retrieve, we instead turn to wget to download a copy of the offending site. And lo, the server responds with the data we're looking for. I'm not sure whether this is an attempt at frustrating analysis of the site, or whether this is standard crawler countermeasure, but it's interesting nonetheless. There are a few interesting things here. Most of the code is unobfuscated and nicely formatted. The authors even left a helpful comment to note that it has been tested to work on Chrome and Firefox. Additionally, the authors do not want this site to be indexed by search engines - so much so that the robots meta tag is added twice. Finally, the inclusion of jquery reveals the site author to be an experienced web developer; especially since none of the JS on the site actually uses jquery. Interestingly, the particular version of jquery used here is 18 months out of date. I can only assume, but I imagine this is how the scammers measure the amount of traffic driven to their site, and possibly even the conversion rate of visitors to phone calls. Let's break this into pieces. The first part of the script is a piece of unobfuscated text that controls the contents of the popup dialog. Presumably this allows easy editing of the message in the future (such as adding the phone number). We can quickly see that these are names of JS functions, as well as the name of the fictional worm infection. It's worth mentioning here that the script uses very peculiar variable names such as _0x45bf to make analysis more inconvenient. These are deliberately picked to look like hex constants, but they're really just identifiers - the leading underscore makes sure they are parsed as such by the JS interpreter. In the following I will rename these identifiers to more readable variable names, with a rough guess based on how they're used. As before, I have formatted the script to make it a bit more readable. We can see that the pattern of obscure variable names continues. A new pattern we will see a lot of are expressions of the form _0x5954e7['\x70\x75\x73\x68']() (after deobfuscation: list['push']()). These are in fact method calls. JS is peculiar in that objects are a lot like dictionaries, and a call of the form foo['bar']() is fully equivalent to foo.bar(). Although the former version is valid, you would rarely encounter this in normal JS code, and it works as an added layer of obfuscation. The sole purpose of this function is to shuffle the list of strings we've seen earlier. The inner loop repeatedly calls list.push(list.shift()). In JS, shift removes the front element of a list, and push adds it to the back. In other words, one loop iteration simply rotates all entries one to the left. I've shortened the string identifying the malware to wormName to make things less busy. Amusingly, hex constants are used whenever possible, even when it's completely pointless: One example here is 0x0. This function is quite simple: It just returns an entry of the shuffledStringList array at the specified index. As an additional indirection, the index is passed in as a string, and converted to an integer using the expression idx = idx - 0;. The reason this works is due to a peculiarity of JS, which will automatically convert strings to decimals when they are used in an arithmetic operation. The first thing we notice are a lot of calls of the form _0xf45b('0x0'). These are calls to the indexStringList function we looked at earlier. We already know that these simply return entries from the shuffled string list, so we can directly replace them with their final value; _0xf45b('0x0') becomes onbeforeunload and so forth. First, it registers an onbeforeunload handler, which the browser calls when the user tries to close the tab or attempts to navigate away from the website. When this happens, the script will open a pop up to prevent the user from leaving. It's unclear why browsers allow this. The script then pops up a modal confirm dialog warning the user about possible infection and the hotline number to call. Interestingly, it does not use alert as is more commonly seen. The main difference between the two is that a confirm popup gives the user a choice between Ok and Cancel, even though this script does not care what is actually clicked. It's possible that this is a weak attempt at circumventing adblockers/anti-malware plugins. Regardless of what dialog button the user clicks, the script then enters a long loop that keeps appending numbers to the URL and adds the new URL to the browsing history. This spams the history with the URL of the scam website, effectively rendering the back button useless. This is another measure to prevent the user from leaving. With all obfuscation removed, we arrive at a remarkably simple script. Its main purpose is to deliver a scary sounding message and make sure the user stays on the website long enough to read it (and, hopefully, call the number). Reassuringly, this script was not capable of dropping actual malware on my machine. We can now also see the reason why my browser froze: Absurdly long URLs and spamming the history object are two things Chrome does not handle well. Even though tech hotline scams are relatively low tech compared to proper malware attacks, a surprising amount of effort went into obfuscating the JS script on the site. The simplified script measures in at less than 30 lines, but took a couple of hours to reverse engineer. Together with the lightweight site structure and cleanly formatted code I'm tempted to believe this was written by someone surprisingly competent at web development. I can only guess why they forgot to add a phone number to actually make the scam work - either it was a crucial oversight, or what I saw was only an early test version of what will later become a proper scam site. Something that is slightly disappointing is to see how little JS it takes to actually set this up, and how easy it is to make a browser completely unusable to the point where we can't leave a website and need to restart. Given the amount of ads delivered every day and how easy it is to sneak in 30 lines of JS somewhere, I'm surprised this does not happen more often. Either way, this was a fun project to spend a few hours on. Next time you land on a scam site, why not poke around at its source and see how it works? You might learn something interesting.